Spring break is right around the corner. Between high ticket prices and stressful security lines, the idea of air travel for an entire family may be unappealing. This vacation season, consider staying state-side and book a trip to one of the Mitten State’s many family-friendly destination cities. Springtime weather in Michigan can be unpredictable, but rain or shine, these hot spots have plenty of exciting activities and must-see attractions the whole gang will enjoy! Great Wolf Lodge: Splish, splashy thrills abound at this 39,000 square foot indoor water park complete with slides, wave pools and even a spa for kids! And, as an HBX member, you can save on admission for the whole family. 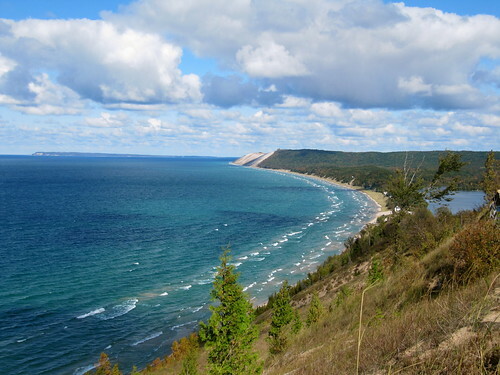 The Great Outdoors: Enjoy exercise and fresh air by taking a family hike along one of the many stunning trails at Sleeping Bear Dunes. These impeccably cared for trails provide awe-inspiring atmospheres – from gorgeous blooming cherry blossoms to magnificent views of Lake Michigan. And if the rain is coming down, your family can get a solid dose of nature at the Boardman River Nature Center or by touring one of the town’s many historic lighthouses. Ann Arbor Hands-on Museum: The kids will love getting creative and learning fun facts at this engaging and interactive museum, which features exhibits on a range of topics including science, technology, psychology, health, media and more. Kelsey Museum of Archaeology: Housing a collection of nearly 100,000 artifacts from ancient civilizations, this museum is a wealth of historical treasures that will fascinate the whole family! Matthaei Botanical Gardens & Nichols Arboretum: Enjoy the beauty of nature at this 300-acre garden with stunning, lush displays and outdoor hiking trails. Zingerman’s Delicatessen: This landmark restaurant is famous for its robust sandwiches, served on delectable, distinctive breads. Frederik Meijer Gardens & Sculpture Park: With more than 6,000 colorful butterflies, you’ll feel like you took the family on a tropical vacation while exploring the park’s conservatory. Grand Rapids Children’s Museum: Offering an array of educational, interactive programs and exhibits, the museum is a must-visit location for families with little kiddos. Higher Ground Rock Climbing: Reach new heights of fun at this indoor climbing center, which has options for climbers of all experience levels. The West Michigan Whitecaps: Swing for a fun time by taking the family to one of the 22 home games the Detroit Tigers’ affiliate will play during April and May. Don’t forget, as an HBX member, you can save at exciting destinations across the state. And for more ideas of fun, family activities to do around Michigan this spring, check out AHealthierMichigan.org.